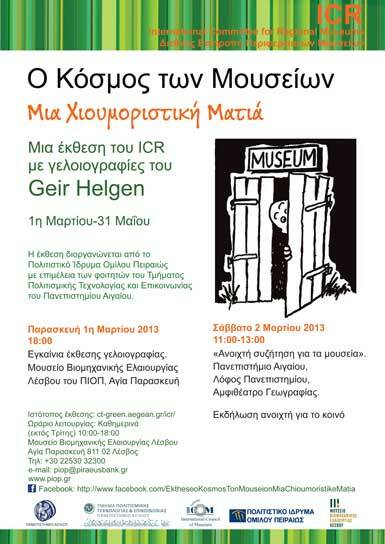 On Friday, March 1st, the exhibition of cartoons by the Norwegian Geir Helgen titled “Museums: the world inside” was held at the Museum of Industrial Olive-Oil Production in Lesvos, which belongs to the Piraeus Bank Group Cultural Foundation (PIOP), in Agia Paraskevi. Geir Helgen is a linguist, historian and archaeologist, with a long professional track record in the museums of Norway; he is also an exceptional amateur cartoonist. His drawings record and deftly satirize how museums are perceived by their visitors, but also by those working in them. The exhibition, which was originally organized in 2009 in Italy by the International Committee for Regional Museums (ICR) of the International Council of Museums (ICOM), has already travelled to a number of countries in Europe (Croatia 2010, Slovenia 2010, Austria 2011, Finland 2012). In Greece, it is being held for the first time, on the initiative of Yannis Markakis, deputy chairman of the ICR Committee and director of the “Lychnostatis” Museum of Traditional Life of Crete; it is co-organized by the ICR, PIOP and the Department of Cultural Technology and Communication (TPTE) of the University of the Aegean. Under the coordination of TPTE associate professor Maria Economou ([email protected]), students of this Department have curated the exhibition in the context of the course Organization of Exhibitions, and have publicized it on the Web and on social networking media. The exhibition will be open to the public daily (except Tuesdays) during the working hours of the Museum of Industrial Olive-Oil Production in Lesvos (10am-6pm, tel. : +30 22530 32300).